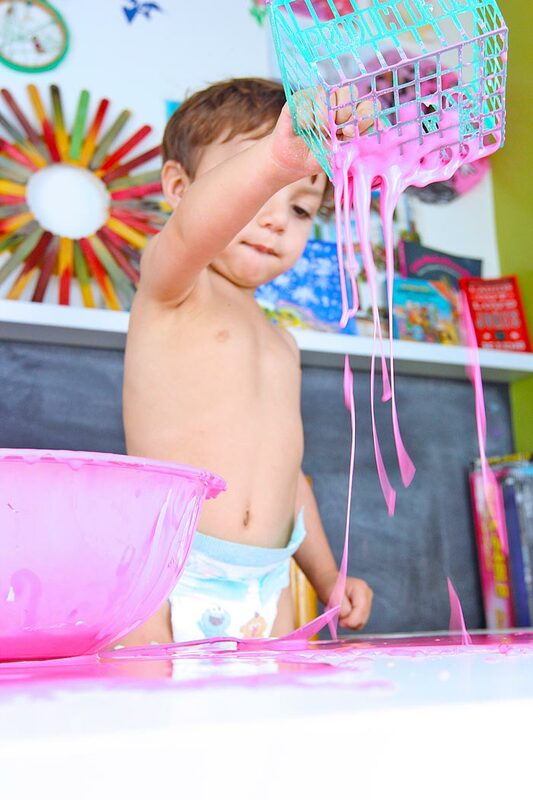 Say the word OOBLECK in my house and my daughter will come running…..Oobleck was actually the very first science experiment I tired when I was the science parent at our co-op preschool years ago. I chose it because it’s no fail and always a hit; I mean really, who can resist a slippery, gooey substance that forms a ball when you squish it together but quickly melts into a liquid when you let go? 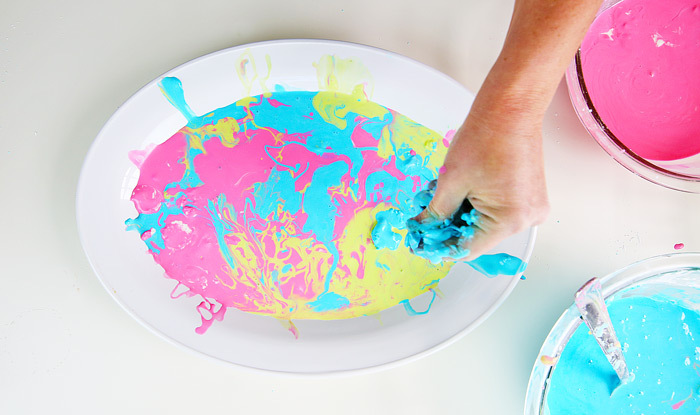 Today I’m going to show you how to make oobleck, a weird and wonderful substance! Before we start let’s talk about just what oobleck is. Oobleck is a non-Newtonian fluid, a fancy term for a liquid whose viscosity changes depending on pressure. Viscosity is the measure of friction in a liquid and determines how fast or slow a liquid flows. 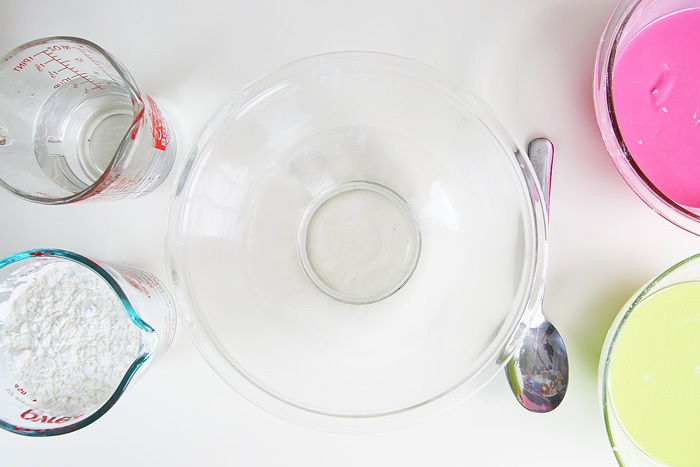 Most liquids have what we call consistent viscosity, for instance honey and water will always flow the same no matter how you pour or press them. Oobleck on the other hand does not have consistent viscosity. If you apply pressure to it, it forms a solid, loosen the pressure and it melt back into a liquid. Because the viscosity changes, it is classified as a non-Newtonian fluid. It’s actually both! Oobleck behaves like a solid or a liquid depending on the pressure exerted on it. Press it together and it feels solid, let is sit in your hand and it drips like a liquid. Now enough of the details, let’s get to the making! Oobleck always requires some fine-tuning. I start with the basic ratio and then add more water or cornstarch deepening on the consistency that I’m getting. What is the consistency you are looking for? If you’ve never made oobleck before one of the hardest things to figure out is just what you are looking for in terms of consistency. I use this as my guideline: When mixed you should be able to press a handful of oobleck into a ball in your hand; when you release the pressure the ball should “melt” back into a liquid. If your oobleck is too watery, add a couple tablespoons of cornstarch and mix. 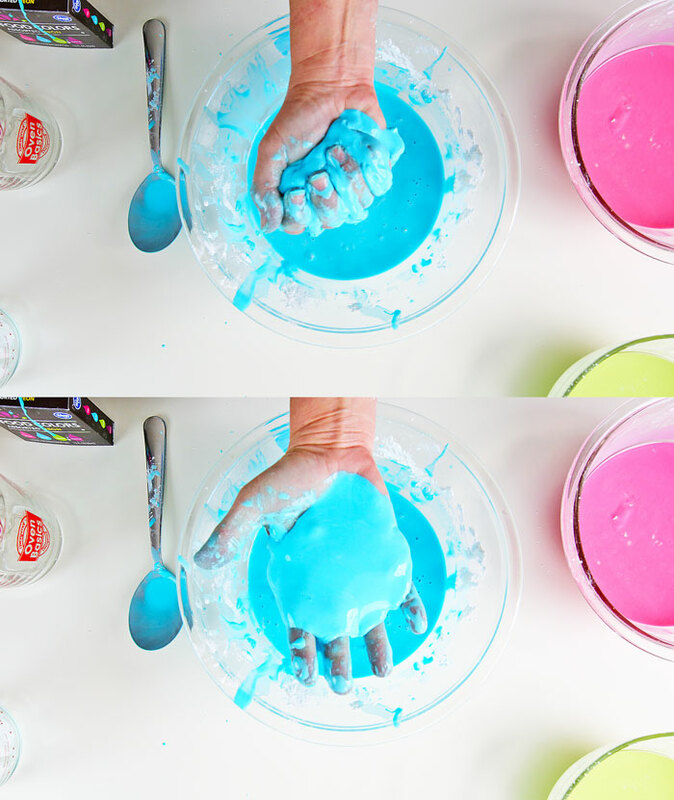 If you’re oobleck is too flaky or solid, add a couple tablespoons of water and mix. 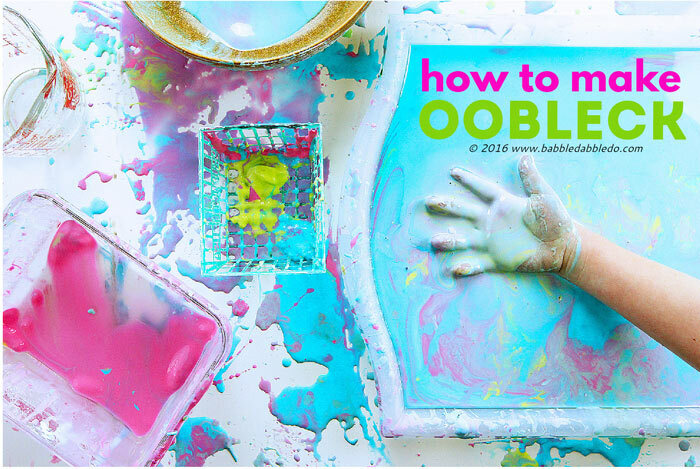 If you want to make several colors of oobleck make them in separate batches and then dribble the colored oobleck together. I do not recommend dropping different colors of food coloring directly on the oobleck as it will quickly mix into a purple mess. 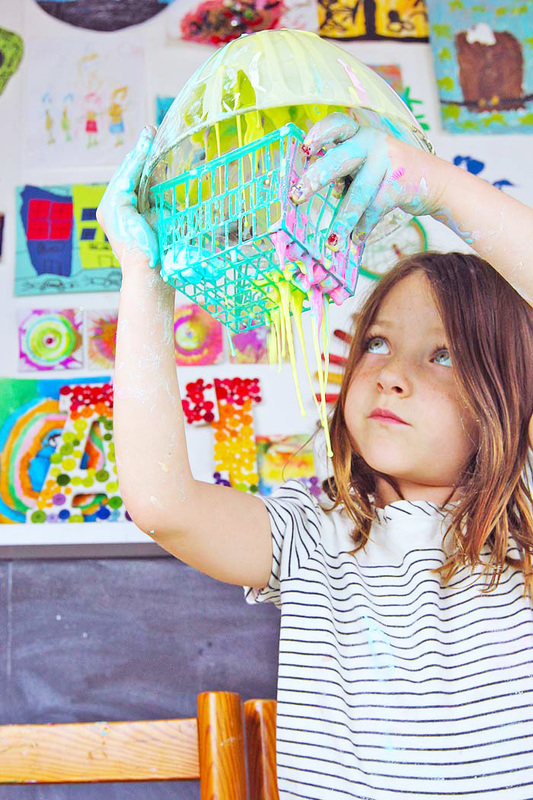 Oobleck tends to dry out quickly with a lot of play. If that happens simply refresh it by adding a little more water. Oobleck is messy! But here’s my number one tip for cleaning it: LET IT DRY! Once oobleck dries it returns to a cornstarch powder that can be easily swept or vacuumed up. 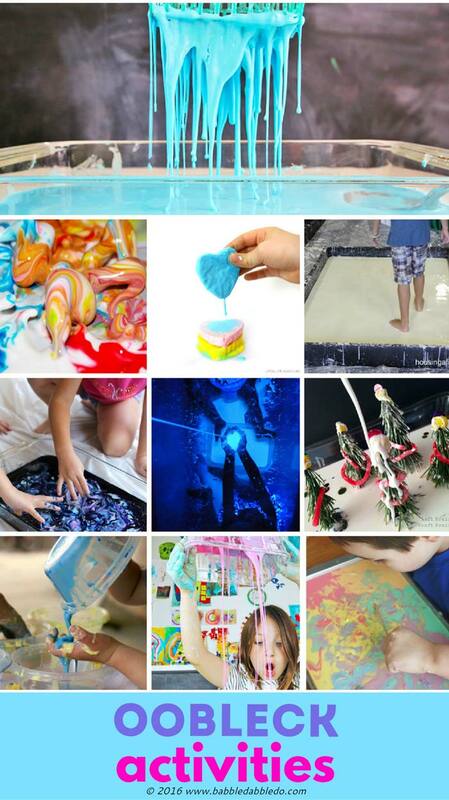 To store oobleck let it dry out in a bin open to the air, then refresh it with water when ready to use again. I tried storing it in an airtight container and after few days it spoiled. Try using strawberry basket! Place a wad of oobleck in a strawberry basket and watch it drip through the bottom! 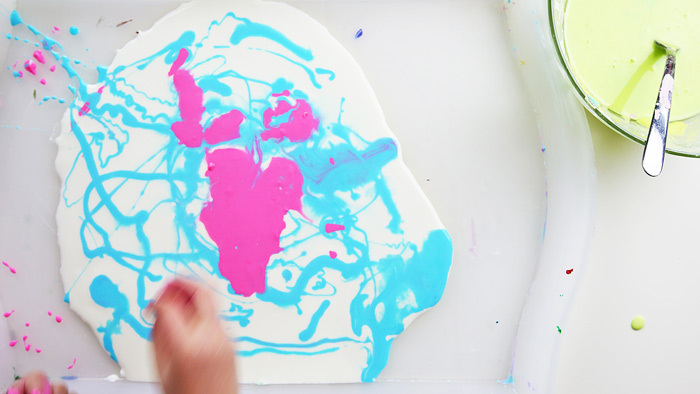 Make batches of oobleck in different colors then drizzle the colors together onto a large shallow tray. My daughter even made a heart with her oobleck. This was a hit at a recent event! This is the coolest impromptu activity for a group. 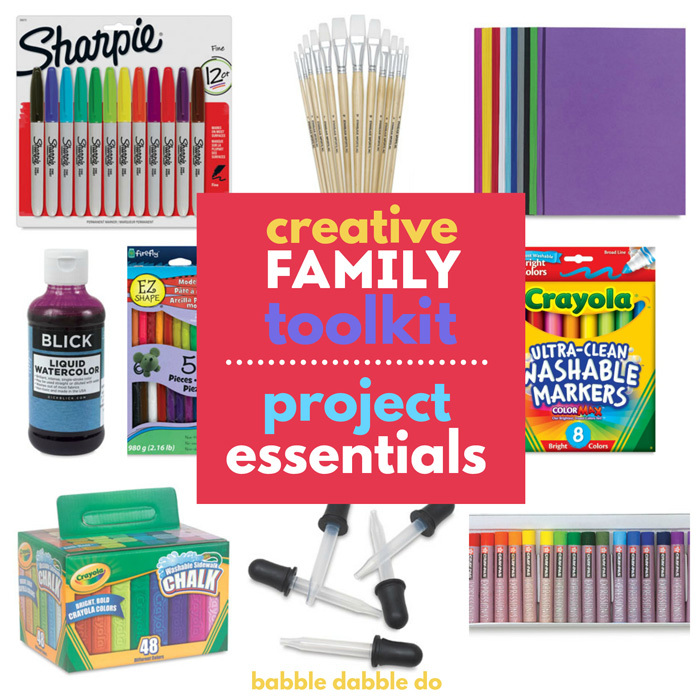 Make a TON of oobleck, add in some baskets, colanders, buckets, splatter guards and sieves and build! If you enjoyed this be sure to check out Wizards’ Brew, another favorite in our house! Subscribe to our free newsletter and or our YOU TUBE channel to have all our videos delivered right to your inbox! Does the food dye ever stain hands and also where did you get that awesome kids Frida shirt? It washes off for sure and the Frida shirt os from Mexico, a present from Grandpa! 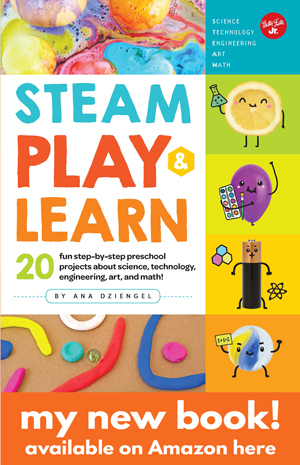 This is also called goop and has been around for years in early childhood settings. We love oobleck in our house too. But for some reason, I don’t think we’ve ever done it with different colors at the same time. They look so pretty in yours – with the blue and pink mixed together like that. Awesome pics! 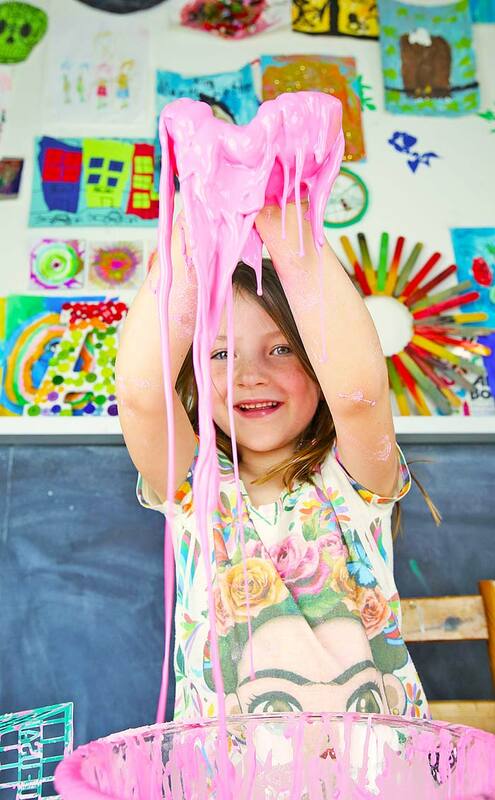 In our house we call it slime, but the result it the same – the kids come running! lol! 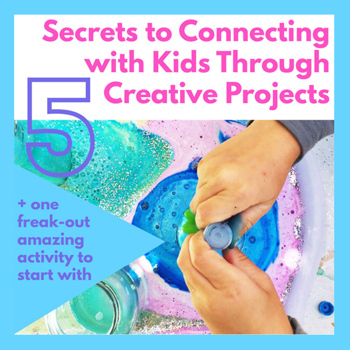 it’s a great go-to activity just for that reason! My preschool. 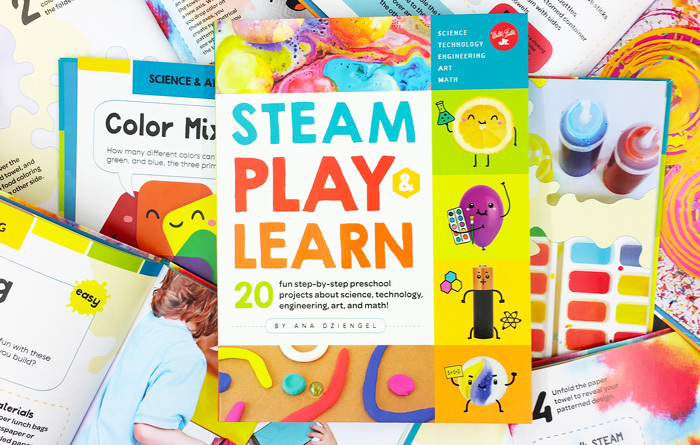 classroom children really enjoy this activity. Thank you. Lots of fun. woot woot! Always a blast!!! Looks like you had an amazing party!